SpectraFix Natural Artist Materials was conceived in 2007 in the San Francisco Bay Area of Northern California, when artist Della Heywood created her first batch of natural casein fixative based on a 100 year old recipe used by Edgar Degas. Astonished at its versatility and delighted by its friendly fumelessness, she continued to use it in her studio for two years until finally deciding to create a product that other artists could enjoy. 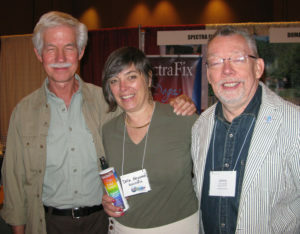 The International Association of Pastel Societies Conference in 2009 was SpectraFix’s debut into the art world, and began spreading the word. Since that time, SpectraFix has created several new innovations in natural water-based, bio-polymer coatings, always placing working properties and permanence as our ultimate goal, but never compromising our commitment to zero toxicity. Each formulation avoids the use of any substance which would be harmful to human health or the environment. We feel very strongly that artists should not have to breathe or touch anything that could in any way impair their health while at the same time enjoy excellent working properties and archivability. If we can’t do it without using toxic chemicals, then we simply won’t make it. Period. The 21st century artist deserves products with integrity, products that innovate based on historically proven foundations, and improve the creative user experience. That is our goal, and we are so delighted you are here to learn more. Please give us your thoughts and feedback, we are always glad to hear from you!